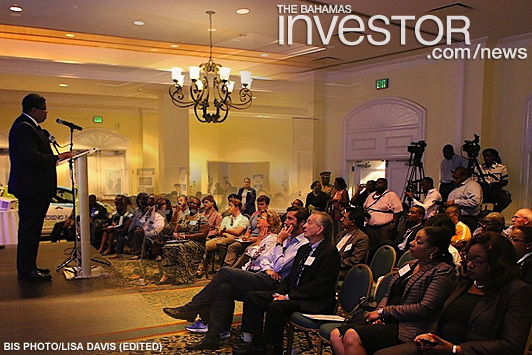 Deputy Prime Minister and Minister of Finance Peter Turnquest was the keynote speaker at the Sustainable Grand Bahama Conference, hosted by the University of The Bahamas, and held at the Grand Lucayan last week. During his address he said that one of the ways sustainable development is being mainstreamed in the educational system is through the national development planning process. The Deputy Prime Minister noted that The Bahamas is strongest when all share a common vision and participate as individuals, communities and institutions in advancing those shared goals. As such, he complimented the University of The Bahamas’ leadership position in the current discussion on Grand Bahama. “We need an educational model that develops analytical skills and critical thinking in our young people. He noted that for Grand Bahama, there are three educational priorities that must be developed in order to advance the island’s sustainable development goals. The educational priorities for Grand Bahama include creating more opportunities in technological disciplines: in this regard, he noted that young Bahamians must be exposed to more opportunities and careers in the field of technology – one of the reasons why the government has focused on the technology hub for Grand Bahama. Secondly, Minister Turnquest said there is a need to harness the power of education, to widen the island’s participation into the traditional industries in Grand Bahama. The Islands of The Bahamas has been nominated in nine categories in the 25th World Travel Awards including the region's Leading Beach Destination, Leading Dive Destination, Leading Luxury Island Destination and Most Romantic Destination. Director general of tourism Joy Jibrilu attributes the robust tourism figures of recent months to a combined effort by resorts to enhance their offerings and successful social media campaigns. Watch an interview with Jibrilu here.